When an abandoned warehouse in Washington, D.C., bursts into flames on a cold winter night, the first investigators on the scene instantly spot similarities to a string of recent fires in the area. There is one difference, however: This one has a human casualty. The local team insists the murder is an isolated incident, concluding that the culprit must be a bored young man suffering from an uncontrollable impulse to act out anger and sexual aggression. But when Special Agent Maggie O'Dell is called in, everything she sees indicates that this is the work of a far more dangerous and calculating criminal. Jeffery Cole, a reporter looking for his big break, is also at the scene of the crime and decides to make Maggie part of his news piece, putting the spotlight on her and digging up aspects of her past she would rather forget. Maggie's half brother, Patrick, is back in D.C. too, working for a private firefighting company, and he is frequently called in as these fires continue to light up around the city. As the acts of arson become more brazen and bodies keep turning up, Maggie's professional and personal worlds begin to collide dangerously. She starts to fear for Patrick's safety as he is sent into the flames set by this madman again and again, and Jeffery is becoming a very unwelcome distraction. Meanwhile, the arsonist-murderer may be much closer than Maggie imagines. 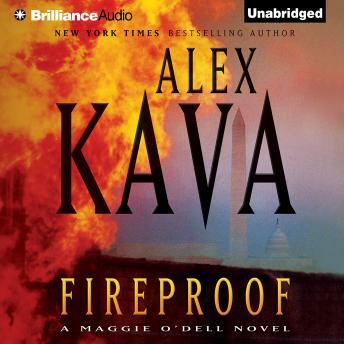 Fast-paced and filled with haunting imagery of raging fires and smoke-blackened skies, this sizzling new addition to the Maggie O'Dell series is Alex Kava's most thrilling work yet.